The Dragon’s Treasure. Near the Kingdome there is one dangerous dragon that steals the valuable objects and keeps them in his nest. He also steals the golden objects that belong to the king which means that he has quite a lot! By now the dragon has stolen six very valuable, but at the same time, very important royal objects. Those objects have to be found very soon because they tell many things important for the royal history. Sir Lionel, together with Daniel and Aleida, has the task to see what’s going on in the dragon’s place. They have arrived at his nest with an aim to find the royal valuable objects. This is a rather dangerous mission, because they have to do everything without being noticed by the dragon. If the dragon sees them, who knows what could happen, maybe they will become his tasty dinner! So, let’s help those three find the valuable objects but also to escape from the scary dragon. Finding those special six royal objects won’t be that easy because the dragon’s treasure is rather big but with our help, everything could turn out to be just fine. 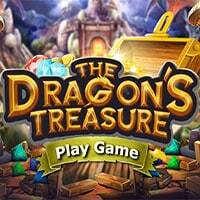 The Dragon’s Treasure is a free online hidden object game on Hidden4Fun.